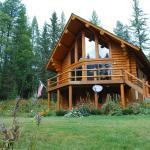 Located 16 km from Whitefish and 33 km from Kalispell Astrid Cabin Montana offers pet-friendly accommodation in Columbia Falls. Guests benefit from free WiFi and private parking available on site. There is a seating area and a kitchen. Towels and bed linen are offered at Astrid Cabin Montana. Glacier Park International Airport is 20 km from the property.